It’s a “blink and you’ll miss it” type thing and easy to overlook. But, if you have elite status on American Airlines, or certain AAdvantage credit cards with Barclaycard or Citi, you’ll want to change it. I’ve been thinking about taking a trip down to New Mexico recently and it got me thinking about fare constructions and how to get to regional airports as cheaply as possible. The idea here is to fly on Oneworld into a hub city or cheap destination, and then use Avios for the (usually) more expensive, shorter leg of the itinerary. After staying at the Hyatt Regency in Boston, and hanging around in Bean Town for the better part of the day, we headed to the airport around 6pm for the 9pm flight. Check-in and security went quickly, and after only about 20 minutes, we were in the Aer Lingus Gold Circle Lounge in Terminal E waiting to board. After enjoying the small lounge for a short while, we boarded around 8:20pm. There’s something so great about experiencing a brand new product. Aer Lingus recently refreshed their business class cabins (late April, according to the booklet at the seat). We were assigned to seats 3D and 3G, both aisle seats in the middle of the cabin. I had 3G. First impressions were… WOW. It looks so fresh. The cabin is done up in shades of gray with splashes of emerald and lime green, which is gives it a very distinct, chic look. They made sure to put their clover branding all over everything – it was done well and added cohesion. It looked and felt very modern, and I was positively giddy to have this flight experience. The plane was an Airbus 330-300 and right away, I started to feel a little more Irish. It was a dark overnight flight, so forgive the graininess of some of the photos below! Aer Lingus business class seats showing up as economy on United website? A-ha, so now I’m finally getting to it: the crux of all my recent Aer Lingus posts. I noticed that when selecting Aer Lingus business class seats on the United website, they are showing up as being in the U fare bucket – which is economy class. I was perturbed about paying for business class seats (with Avios) only to see that I’d maybe been booked in the wrong fare class. However, I called British Airways and Aer Lingus to verify that I am indeed in a business class seat. But then I went to look again on the United website to make sure it wasn’t just a glitch. For this dummy booking, I selected economy class to Dublin and business back from Dublin. It looks like economy is being booked into the T bucket and business is being booked into U – but U is economy. I plugged in the record locator into the Royal Jordanian website, and sure enough, their system displayed the same information. But, it still says business on the BA website. Of course, I’ll be pretty miffed if it does actually end up being economy, but 6 hours over the pond isn’t so bad. I’ve done it before and I’ll do it again if I have to. I’d be a tyrant to get my Avios back, though. But that’s worst case scenario stuff. I’m gonna let this be a trust fall with British Airways and assume they’ll catch me (there is a good joke and punchline in here somewhere…). Has anyone else noticed this mislabeling on the United website? Even better, has anyone flown the flights and can confirm they are indeed in business class? Either way, I will have Aer Lingus trip reports soon enough. Looking forward to it, and to visiting Ireland, so very much. …and to get confirmation numbers. Booking those Aer Lingus flights last week with Avios has kicked up a few little issues that I’ve never dealt with, so thought this might be useful to post. British Airways gave me a confirmation number when I booked the Aer Lingus flights… but not for Aer Lingus. I could only access the reservation on the British Airways website. I wanted to be able to pull up my flights on the Aer Lingus website, but didn’t have the confirmation code that British Airways gave Aer Lingus. Enter Royal Jordanian (with a HT to George at Travel Blogger Buzz via Twitter). On the Royal Jordanian website, hover over “Plan & Book” and then click anything in the “Manage the Essentials” part of the dropdown menu. Once there, click “Manage Booking” or follow this link. All important things for preening and double-checking reservations. I could, for example, use Avios to book a flight on American, and then add my AAdvantage frequent flyer number to make sure I get elite benefits like early boarding. I can also simply take the record locator for the AA flight and then plug it into the AA website… something that British Airways doesn’t give you on their website or in any of their emails (someone correct me if I’m wrong – I just booked a US Airways flight with Avios and couldn’t find the freaking US Airways record locator for the life of me). There’s my US Airways record locator – how handy! I noticed in the web address on the RJ website that they were pulling from Amadeus – the same system that Check My Trip uses. It’s a bit dated and still has the copyright as 2014, so take that for what it’s worth. But it works like a charm. But not AA or US Airways… they don’t use Amadeus. It is handy, however, for adding AA flights booked with Avios to your AA account. And for adding your AA number to the reso to receive elite benefits. And who knows, sometimes they end up crediting award bookings as paid flights on accident. Handy little trick, thought I’d share for my Oneworld peeps out there. Let us know if something similar exists for SkyTeam. United is really good about showing the other airline’s record locator on their website already. And on this note, other tips are certainly always welcome! Consider this post to be that phone call right after you hang up but then discover something cool and call back again for another 30 seconds just to add another thought or two. In researching my previous post, Booking Dublin: A Change of Plans, I wanted to verify award availability on Aer Lingus business class for the BOS-DUB route for the rest of 2014. Partially because I wanted to see where my own rebooking could fit in, and partially out of pure curiosity (because who doesn’t spend their Sundays looking at random award availability?). Well, it’s still out there, and the clock is ticking. You have until April 28th, or until availability dries up – whichever comes first – to book yourself flights to Dublin and back. It’ll set you back 50,000 Avios, but 50K points to Europe round-trip in business class is a great deal, especially considering that these flights are ~$5,000 each if purchased. I went to United.com and filtered for nonstop award availability. It’s all the BOS-DUB route. Check for the blue and green days – those are the days when the business class flight is available (the yellow is just for the economy flight, which is only 12.5K Avios each way or 25K Avios round-trip – still a great deal especially considering it’s only a ~6-hour flight). Ah, but August and September… fall in Ireland anyone? October and November are great as well – maybe for Halloween or before the holidays? Be sure to tick “Nonstop Flights Only”. When you find the flights you want, make a note of the dates and flight numbers (or just leave it on your screen), and call British Airways. I’ve found the best number to call British Airways on is 1-800-247-9297. At the prompts, press 4, then 2. Then wait for an agent. Hold times are usually not long on this number. Feed them the dates and flight numbers and mention it’s for Aer Lingus business class. Also make sure the Avios are in your account if you are transferring them in from Ultimate Rewards or Membership Rewards (or Starwood, or wherever). Be sure to ask them to waive the phone booking fee – I say something like, “I tried to book online, but was forced to call – can the fee be waived?” And they always take it off. Booking 2 business class tickets cost me 100,000 Avios and ~$228. There’s still great award availability to Dublin from Boston, and at a great price, if anyone’s still interested in booking. Just wanted to share the info, as I’d been wanting to go to Ireland for a long time. In fact, I am tempted to book another ticket in the fall because I know it will be so beautiful there. But, moderation. If anyone does book, enjoy! I will be there in early May – say hello if you see me on the plane or around Dublin! Just booked: IAD-ATL-DUB-ATL-IAD in May for $223 R/T A/I! What is Club Carlson Visa’s annual 40K Gold Points bonus worth? Major change of plans is more like it. Thanks to The Points Guy, I caught wind that an award I’d long had my eye on, BOS-DUB in business class on Aer Lingus, was widely available for booking with Avios points. The good news: it still is. I immediately transferred over some Ultimate Rewards and Membership Rewards (I love combining them when I can and British Airways is perfect for that – so is Singpore) to my British Airways account, and called in to book my dates. Throughout April and May, and possibly into the summer months, award availability is peppered here and there. That screen shot was taken just now. There are still some flights out there. The best way to book this is by checking availability on the United website, then by calling British Airways to book over the phone. I called them post Avios-hack (to change a different set of flights), and my hold time was less than 5 minutes. In fact, I was all booked and set up with flights in under 15 minutes (pre-Avios hack). If you’re interested in booking, you have either one month or when availability runs out, beginning today. The Avios program is changing on April 28th, and this particular award will go from 50K round-trip in business to 75K, which is a pretty staggering change. I’ve been interested in experiencing Aer Lingus business class, and visiting Ireland, for a very long time, so it’s all very serendipitous. But what about the Delta flights? Of course I had a pretty severe schedule change with Delta. I was willing to get down to DC to take advantage of an awesome fare that Delta had earlier this year. I was even thinking I could spend a day or two in DC, maybe catch the tail-end of the cherry blossoms. But when the Aer Lingus award availability came around, I was then willing to get myself to Boston, and am now thinking of spending a day there instead. I called Delta and explained that I had a schedule change of over 4 hours, and that those times no longer work for me – could I please cancel and get a refund? They immediately canceled the ticket and said to expect a refund in 5-7 business days. Awesome. So those are done. It was a great deal, but then again, so is the Avios redemption on Aer Lingus, and even more so now that it’s time-sensitive. The 2 round-trip flights would’ve been over $10,000 had I paid for them. Instead, I got nearly 11 cents per point of value by booking with Avios. An incredible deal – get on it if you can! For a long time, the Chase British Airways Visa has offered 1.25 points per dollar on non-bonus spend. But starting April 30th, 2015, the card will become worthless. And you should dump it. I’ve seen a lot of other bloggers saying how you can still get 50,000 Avios, without paying the annual fee of $95 the first year, and that the card is still worth it for that reason alone. No. 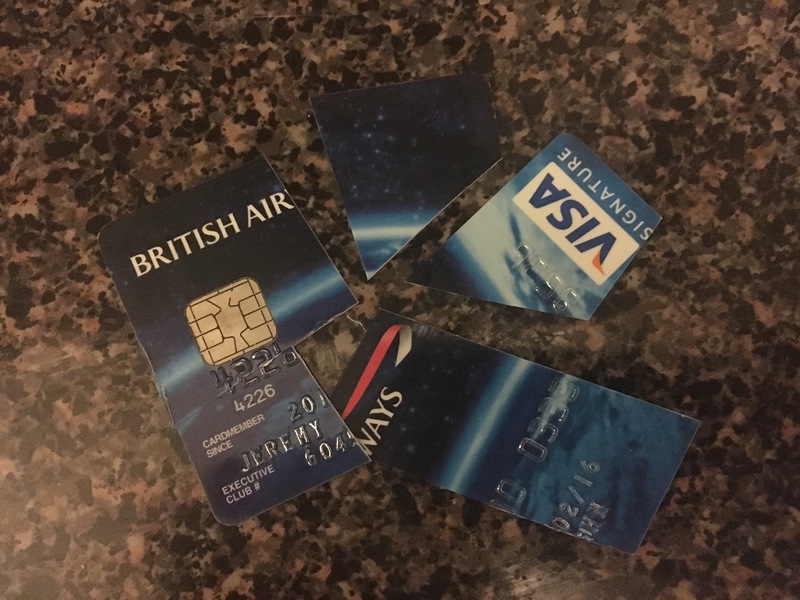 I’ve long been a supporter of the Chase British Airways Visa. I’ve even toyed with the idea of putting $30,000 of spend through the card to trigger the Travel Together companion certificate, despite the outrageous (!!!) fuel surcharges. I even researched Fifth Freedom flights, in part to defend the usefulness of Avios. But this new earning structure, combined with the changes to their business/first class award redemptions, renders the card completely useless. Everyone knows I’m Mr. Earn and Burn: I typically like to keep my miles balances as close to zero as possible. I don’t trust any mileage or point program, really. Not for a second. Every major airline has had a drastic, no-notice-given change to their mileage program this year. That being said, I like to have a little stash.